It’s a devilishly fine line between misguided fascism and pure, unadulterated evil, and the Nebari cross that line several times during this episode. In “Durka Returns,” the only other episode thus far to show one of Chiana’s kinsmen, her jailor Salis—or Elvis, as he liked to be called—was an unnerving presence, a true believer in the efficacy of enforced conformity and the subjugation of free will. While Chiana at one point accused Salis of harboring improper, lustful thoughts towards her, that indicated only corruption on an individual level; Elvis might have been rotten, and he might even have been representative of the typical member of the Nebari’s ruling Establishment, but that doesn’t necessarily indicate an underlying, systemic malevolence. Even the Nebari’s policy of forcible mind control could not be wholly condemned, as Salis insisted it was reserved for dangerous criminals like Selto Durka or Chiana, and he successfully rebuked Crichton’s attempt to get on his high horse by asking whether Crichton had the right to act as arbiter of an alien justice system. The Nebari’s practices might be considered morally wrong by most free-thinking species, but their policies weren’t necessarily any more objectively abhorrent than those of the Peacekeepers or Scarrans, or indeed of the Luxans, Delvians, or even humans. That changes in “A Clockwork Nebari,” although the full extent of the Nebari’s villainy is only gradually revealed. Elvis once intimated Zhaan might benefit from neural realignment, but that played more like a vague threat to regain control of the situation than something he seriously planned on doing. By contrast, Varla and Meelak capture and drug the Moya shipmates into submission because it’s expedient. The Nebari’s treatment of Pilot is particularly cruel, as they essentially punish him for his physiology—with his best friend Aeryn the one actually attaching the control collar, just to add insult to injury—and then Varla has the unmitigated gall to chastise him for resisting, as though it is Pilot’s fault he is in this situation. Like Salis before her, Varla clings to the idea that her invasion of other people’s minds isn’t simply necessary under the circumstances, but it is actually in their best interest. When Crichton offers to be locked up for the duration of the journey as an alternative to mind-cleansing, the standard villain would refuse on the grounds that Crichton is not to be trusted, that he would obviously try to escape at the first opportunity. But Varla instead explains that Crichton will actually thank him once the treatment is completed, and the only other option she is willing to offer is death. The next part of that exchange, in which the Nebari Debra Harry further justifies her actions by noting these are difficult times, is crucial to understanding just how Chiana’s people think. Exactly why Varla considers these difficult times is unexplained, but the only challenges mentioned in the episode are entirely of the Nebari’s own design. The Establishment’s plan to bring the entire galaxy to heel with a contagion is unequivocally monstrous, especially the revelation that the Nebari used their own rebels as the carriers for a sexually transmitted disease they didn’t even know they were infected with. It takes a special kind of hatefulness for a government to take what it finds most heinous about its own deviants—in this case, the hedonistic promiscuity Chiana so frequently and so proudly displays—and fashion that into a weapon to further its own military ends. Neither Varla nor Meelak (in either of his personae) pretends this is an altruistic if misguided effort to make the galaxy more harmonious. They instead talk of worlds thrown into chaos so that the Nebari emissaries—surely a euphemism for invasion forces and colonial governors—will be met with minimal resistance. Admittedly, it’s early days yet for the Peacekeepers and the Scarrans, but neither has yet hatched any plans so unequivocally evil. At least those two races want to fight a war for control of the galaxy, which gives people the opportunity to fight back. If the Nebari are to be believed, the invasion has already occurred, and now it’s just a question of when the Establishment declares its victory. A threat of that magnitude lends “A Clockwork Nebari” a scale seldom seen in previous stories, although it does perhaps overwhelm the more story-specific stakes. After all, the contagion is still out there as a threat at episode’s end, and the events on board Moya only indirectly impact the Establishment’s plans. Varla’s mission is only vital inasmuch as retrieving Chiana could lead to locating her brother Nerri, but the fact that Chiana thought her brother was dead means she is likely of minimal use in that respect; theoretically, she could have been used as bait to draw out Nerri, but that ignores the fact that he already has a Nebari on the inside in the form of Meelak. It’s also difficult to know what Nerri actually intends to do about the contagion beyond generally wreaking havoc; perhaps his ultimate goal is to distribute the antibody throughout the galaxy, but it’s all left vague. In and of itself, that doesn’t especially matter, as that isn’t what the episode is about, but the trouble is that, well, the contagion does kind of feel like what the episode should be about. It works brilliantly as a way to establish just how fearsome and uncompromising the Nebari are, but it’s a little too huge to be used strictly as a plot device, especially when the show’s heroes have nothing directly to do with it. Then again, that does rather reinforce the idea that Farscape’s main characters are, for all their strengths, not the saviors of the universe. Crichton’s goals in “A Clockwork Nebari” don’t extend too far beyond saving his own skin and those of his friends. This sets up one of the more intriguing exchanges in this episode, as Rygel reveals to Crichton he’s perfectly willing to conform to Nebari expectations if it saves him from the mind cleanse. While even Rygel likely wouldn’t have been able to justify such a self-serving compromise if the contagion were a more central element of the episode, here he is able to provide a chilling example of the banality of evil; as long as the Nebari would be willing to leave Rygel alone, the Dominar sees no particular need to resist them. Besides, by keeping the focus just on the crew’s efforts to save themselves, writer Lily Taylor—making her scripting debut after a long tenure as story editor—is able to point out that, again, our heroes do seem to bring these things on themselves. After all, in both Nebari-centric episodes, it’s suggested the Nebari interlopers only manage to get on board Moya because of some mistake by Crichton and company. Indeed, a major theme of “Durka Returns” is that the shipmates’ predicament is almost entirely of their own making; in particular, it’s only Rygel’s incessant meddling that unlocks Durka’s buried psychopath. While that earlier episode actually showed the near-collision that brought Chiana and her jailors onboard Moya, “A Clockwork Nebari” opens with Crichton and Chiana bickering over their latest botched mission, and then the mind-controlled Aeryn and Rygel show up mere minutes later. By now, Farscape takes it as a given that its heroes are screw-ups, so there’s no particular reason to actually show the mistake that triggered their latest mess. While Zhaan gets only two lines in the entire episode, we see quite a bit of the mind-cleansed Aeryn and D’Argo. It’s telling that D’Argo’s conditioning reveals an almost childlike interior, as he weeps and apologizes to Crichton for all the horrible things he has done, but Aeryn regresses into a calm fascist, someone Varla can count on to follow her orders unquestioningly. I’d say this indicates an essential difference between Luxans and Peacekeepers—the former may have a warrior culture, but Peacekeepers are literally bred to be soldiers, and that shows once D’Argo and Aeryn’s personalities are essentially stripped away—and also perhaps between D’Argo and Aeryn as individuals. If nothing else, this all ties in well with the idea that D’Argo is still little more than a boy by Luxan standards. Plus, the single scariest moment of the episode is when the voice of the conditioned Aeryn is heard off-screen, calmly but suspiciously asking Crichton and Rygel what all the commotion is about. There’s a popular argument in fiction that heroes tend to create their own villains; for instance, just about every retelling of the Batman story kicks around this idea, and the current incarnation of Doctor Who returns to this trope in pretty much every season finale. Farscape has made use of this trope in the past—Crais’ mistaken vendetta against Crichton is pretty much a textbook example—but lately it has gone in the opposite direction, suggesting villains create their own heroes. More specifically, the show’s villains tend to unleash whatever version of Crichton is necessary to defeat them. “Unleash” is the right word, as much of Crichton’s recent heroism has depended on using his insanity as a weapon, with the most notable example being his escape from Braca’s clutches in the “Look At The Princess” trilogy. Here, the Nebari may be evil, but they are also resolutely calm, principled, and practical, so the sort of man who can defeat them is an irascible, violent, and lecherous pervert, and Crichton is only too happy to oblige. Crichton proudly declares that all his dirty thoughts and nasty urges are still intact, which he proves by feeling up and slapping Chiana and by beating up Rygel. It’s worth noting that Crichton—and, by extension, his shipmates, because Rygel definitely wasn’t planning to do anything—would never have escaped Varla’s clutches if not for Scorpius’ neural chip. After all, Meelak was under strict orders not to jeopardize his position, and he makes it clear he wouldn’t have moved to save them. This story could just about have worked without Harvey, but the episode would then need some contrivance for Crichton to shake off his conditioning; there’s the old standby that Nebari conditioning isn’t designed with humans in mind, but that would seem awfully flimsy when it works on everyone even remotely human, although perhaps the show could have used the “Crackers Don’t Matter” explanation that Crichton is too stupid to be mind-cleansed. Still, Harvey neatly sidesteps any such concerns, providing a powerful narrative shortcut that instantly adds a level of irony to the proceedings, as the only reason Crichton is impervious to Nebari mind control is because something else has already claimed the territory. In terms of its storytelling implications, the neural chip might be the best idea Farscape ever had. Gigi Edgley deserves a huge amount of credit for her acting in this episode, especially considering she spends most of the proceedings chained up—which, considering how essential movement is to her performance as Chiana, must have represented a particularly difficult challenge. Nothing against Simon Bossell, who plays Nerri, but it’s hard to imagine him coming across as anything other than another boring revolutionary in his message without Edgley’s reactions to anchor the scene. She also has terrific chemistry with Skye Wansey as Varla; it’s a bit of a shame they don’t get a few more scenes together, really. Crichton and Pilot’s ruse to get rid of the Nebari is shockingly convincing, particularly the explosions. Regarding the cameo from an anachronistic Crais, I believe it’s already been established that it’s fairly easy in this part of the galaxy to simulate people speaking, but I’m going to float the theory that Pilot actually had to imitate Crais for the recording, mostly just because that thought amuses me. Also, the look on Pilot’s face when he asks Crichton whether it worked—he thought it worked—is just ridiculously adorable. As far as John Crichton is concerned, a human removed of all negative and aggressive thoughts would sound like a surfer dude of alternately Australian and Californian origin. Yes, that sounds about right. “Look, everybody onboard has secrets. We all have secrets. You got one? That’s fine. Keep it. Right up to the point where they come to fry my brain.” There was just no way I wasn’t going with Rygel’s immortal line as this episode’s chosen quote, but this Crichton line is a particularly great distillation of what Farscape is all about. I really must mention the actual mind-cleansing procedure, as Crichton’s eyes are pulled out of his head so that the drugs can be injected. It’s that scene that most clearly earns the episode’s titular homage to A Clockwork Orange, and it’s wonderfully gross and disturbing in a way the show has only rarely been up to this point. I don’t find the scene realistic in the slightest, but I think Farscape can safely tread into this sort of fantastically grotesque territory about once per season, with Namtar in “DNA Mad Scientist” providing the first season example of this sort of thing. There are some things I want to discuss about “A Clockwork Nebari” that are spoilers for the rest of the series. As such, I’ve included a spoiler section down below. While I won’t talk about what happens the rest of the way except in the absolute broadest of terms, I do talk about what doesn’t happen from here on out. So, for those watching for the first time who want to remain as in the dark as possible about what lies ahead, I’d advise skipping right ahead to the comments section. Next week: We look at three of the show’s finest hours with the epic “Liars, Guns, And Money” trilogy. In the DVD commentaries, showrunner David Kemper mentions that it’s a myth that Farscape was designed to run just five seasons, and he specifically talks about hypothetical seasons six and seven. As far as I know, Kemper has never actually talked about what might have happened in those seasons (although if anyone knows more than I do, please correct me). That makes sense, given the fact that the writers never tended to plan Farscape too far ahead, instead favoring a more organic approach to the show’s overarching narrative. Still, if we assume that “The Peacekeeper Wars” does indeed represent a highly condensed version of what would have been the fifth season, then it’s an open question where the show could have gone next. Bringing in the Nebari as the show’s new big bads would have made sense, as the contagion remains perhaps the single biggest unresolved plot thread on the show. That said, I suspect the contagion wouldn’t have been the big story in Farscape’s later seasons; instead, I suspect it would have been the thing that fans would have constantly asked Kemper and company why it wasn’t the big story. 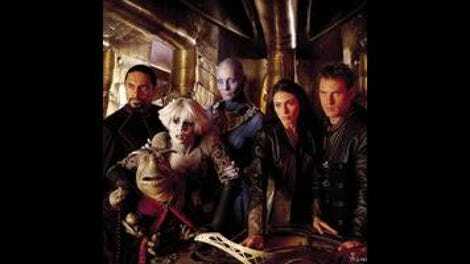 As much as the contagion had the in-universe potential to throw the universe into disarray, on Farscape the series it was just a throwaway element introduced in the show’s relatively early days, and it seems unlikely that a writing staff that generally built the story as they went would have decided to double back to something so minor in the larger context of the show. Besides, as I mention in the review, “A Clockwork Nebari” doesn’t really bother to connect the contagion to the shipmates—Crichton doesn’t really quite gets round to be outraged about it, although we can probably take such a reaction as a given—and so it seems unlikely the contagion would really have been particularly appealing to the writers. But then, just about any new fight Crichton would have taken up probably would seem impersonal after the connection he was forced to share with Scorpius. Whether the Nebari would have emerged as latter-day adversaries or not, I think it’s fair to say they represent the show’s most intriguing unexplored area. Farscape said all it needed to say about Delvians back in “Rhapsody In Blue,” and they didn’t seem especially interesting outside of their relationship to Zhaan; the Luxans don’t get significantly more attention, but they also don’t seem especially compelling beyond D’Argo himself. The Nebari, on the other hand, would stand among the show’s most memorable aliens even if Chiana had died back in “Durka Returns,” as was the original plan. Their belief in absolute conformity and total lack of respect for the free will of others automatically marks them as a supremely alien presence, and their monochrome look might actually be my favorite of Farscape’s extraterrestrial designs. If nothing else, the Nebari really should have been the focus of a mid-season two-parter or trilogy, or even just a one-off episode in which Chiana is recaptured and everyone—Crichton included—is mind-cleansed, forcing an unaffected Rygel to save the day all by himself, completely against his better judgment.